One word to sum it up: Interesting. 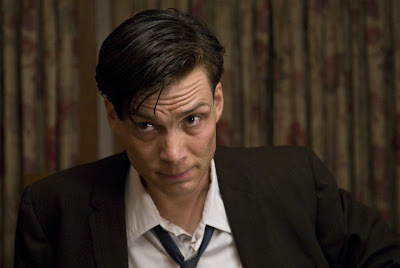 You may remember, back in August/September, I had a wee obsession with Cillian Murphy. I mean, I watched like, nearly all of his movies during that time. One I hadn't seen though, was Peacock. I never thought I would get to see it, considering Cillian is pretty good with having his movies hidden behind the mist and Peacock didn't even look like it would make it to New Zealand. Luckily, it just arrived on DVD, and it was another chance at seeing my favourite actor as a woman again. John Skillpa (Cillian Murphy), a quiet bank clerk living in tiny Peacock, Nebraska, prefers to live an invisible life in order to hide his secret: He has multiple personality disorder, the implied result of childhood trauma inflicted by his abusive mother. His alter ego is a woman, Emma (Cillian Murphy), who each morning does his chores and cooks him breakfast before he starts the day. Then, in a moment, everything changes. A freight train caboose runs off its tracks and crashes into John's backyard, destroying his wooden fence. When neighbours descend on the scene, they discover Emma for the first time and mistakenly believe her to be John's wife. This launches John into the glare of the spotlight, threatening to reveal his secret life. He must then fool the town into believing he and his alter ego are man and wife. A young, struggling single mother, Maggie (Ellen Page), holds the key to his past and sparks a battle between the personalities. Now John must try to stop Emma from taking over completely. Unlike Cillian's previous transgender film, Breakfast on Pluto, he isn't just playing one person. He has to sway his time between John and Emma, which he does effortlessly, even though Emma is a far more interesting character. His performance as John seems to rightly captivate the socially inept nature of him, though sometimes, his use of twitchy mannerisms come off as a little too crazy. The interesting part, though, is the way the two characters are entirely different and there is no facet of John in Emma or Emma in John. It's such a rare gift that Cillian puts to work here, and reminds us why we should still watch all the movies that he's in that done get the biggest releases. Cillian isn't the only well performed actor here. Ellen Page, who also worked with him in Inception, does a fantastic job as the struggling mother who holds a key to John's insanity. Her work is definitely a far cry from the likes of Juno and Whip It. Susan Sarandon also joins the cast as the saint Fanny Crill, and has the whole rich woman out to save the world act down to a tee. It's pretty obvious that she is also contributing to John's personality disfunction. Peacock is as much as you could expect from a direct-to-video movie, even though it's story is a force to be reckoned with. While I felt there was little resolve at the end, and I was left wanting more, I thoroughly enjoyed the movie for the most part. This probably has more to do with the performances over anything else. I was also expecting a muderous sort of tale, but Peacock unravels as a quiet psychological thriller. A psychological thriller which shouldn't be missed. THE VERDICT: Thanks to an enlightening performance from Cillian Murphy, Peacock is a psychological thriller which really flies. Haha, Nebraska. Psychological thrillers seem to work best when set in small quiet towns you'd hardly dream of visiting eh? I still can't believe that's Cillian Murphy in the second pic; I honestly thought the caption was a typo when I saw it a few months back. As in, "you fools, the man has GREEN/BLUE eyes!". Now, tables turned, etc. Angela - They sure do! He has the most beautiful blue eyes I have ever seen. The brown eyes make him look completely different. In fact, he looks more like himself when he is in a girl than he does when he is a man in this movie! Robert - The cast is awesome, definitely check it out!